Pervijze Church, the CWGC notice on the pillar to the right signifying that a Commonwealth War Grave can be found in the churchyard. The grave is that of a Canadian pilot, Flying Officer J. 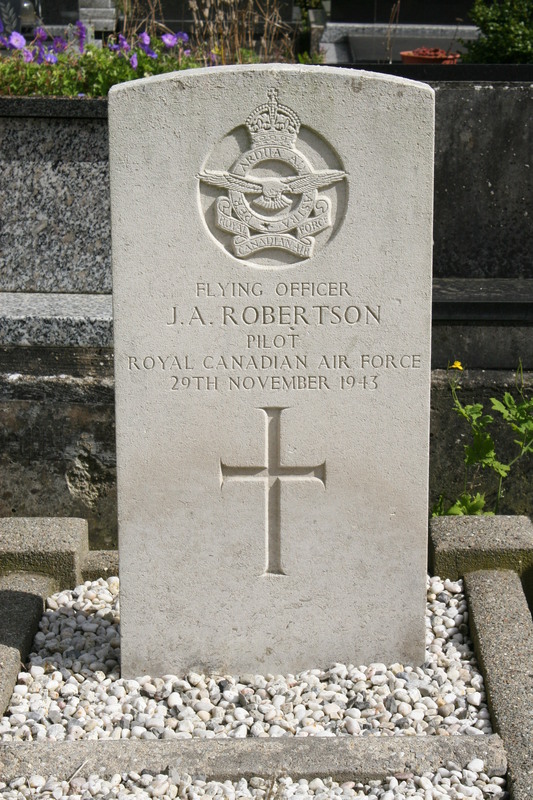 A. Robertson, one of many Allied airmen killed in the skies above Belgium during the Second World War. 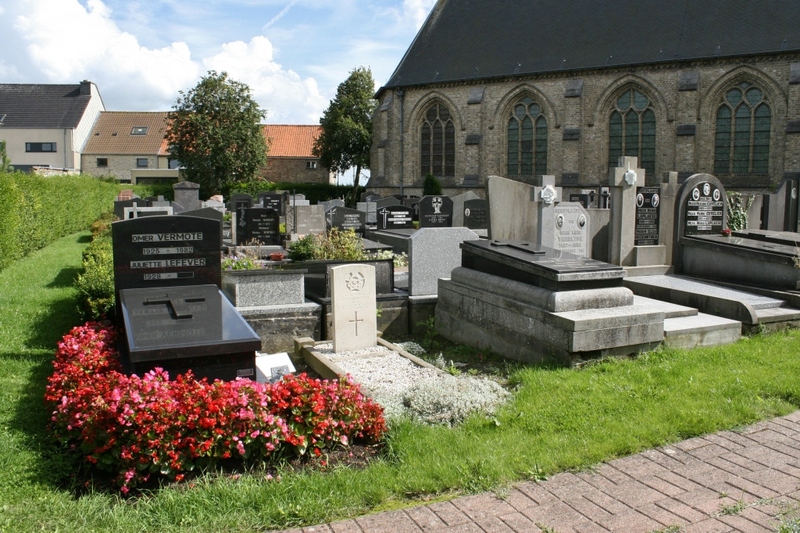 Robertson’s Spitfire was shot down on 29th November 1943, but his body was not discovered until 1946, when he was buried here in the churchyard. 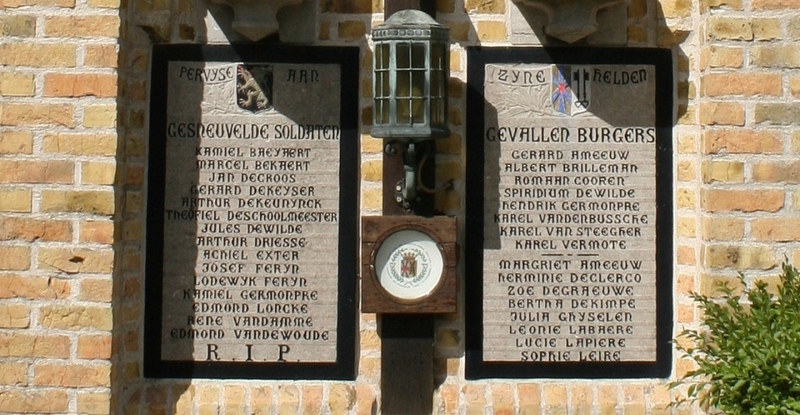 Above & below: Outside the church, the village war memorial remembers military and civilian dead of both World Wars. 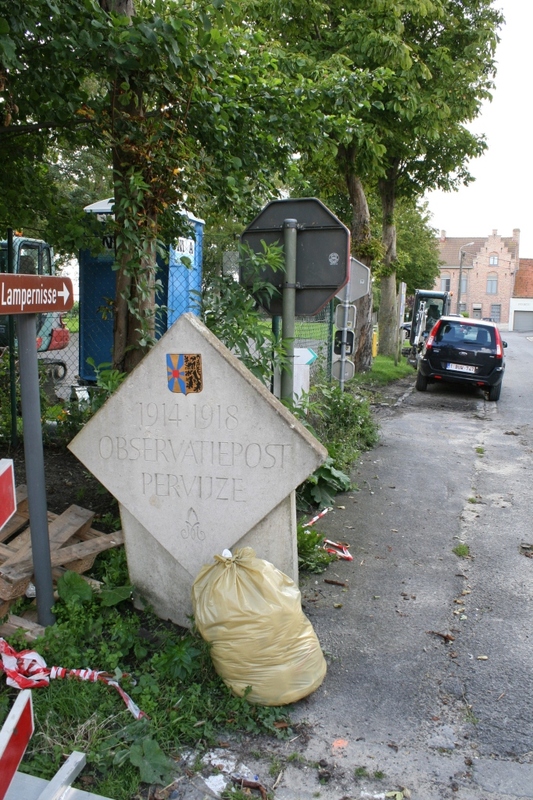 On the road that leads south out of Pervijze, an Albertina Marker reveals the presence of another relic of the Great War. Even your Flemish is good enough by now to work out why we are going to spend a few minutes here. 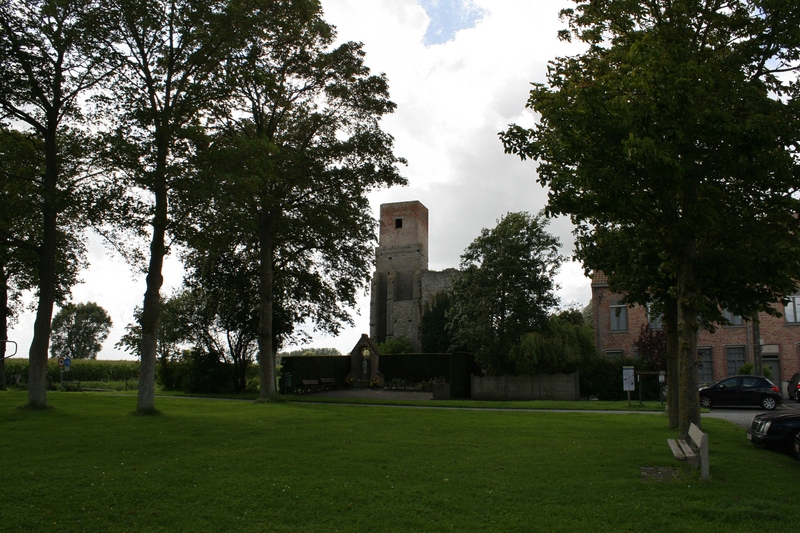 Pervijze was the scene of terrible fighting during the second and final week of the Battle of the Yser in October 1914. 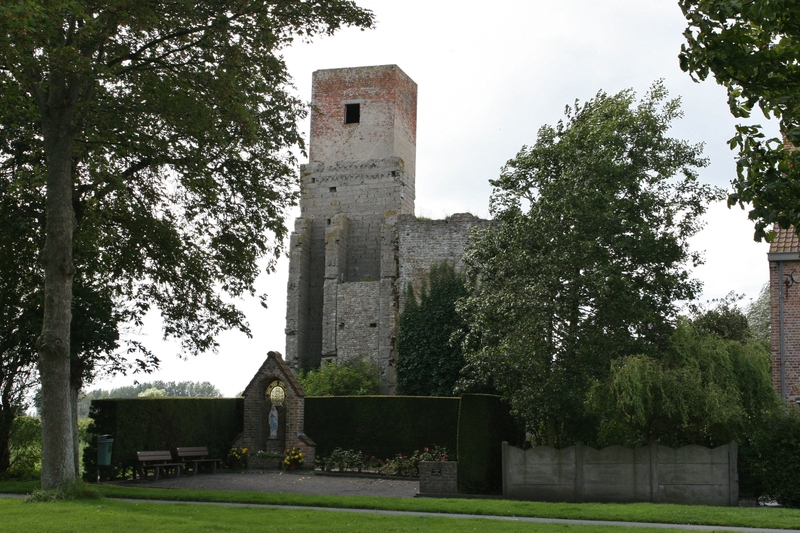 Midway between Nieuwpoort to the north and Dixmuide to the south, the village was the centre of Belgian operations on the Yser. 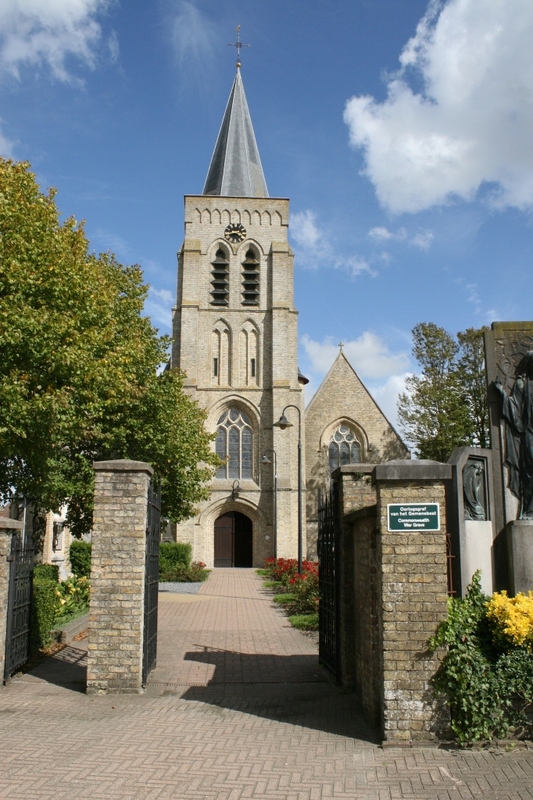 The road west leads to the town of Furnes, and the fall of Furnes would make the defence of the city of Ypres, to the south, where the first Battle of Ypres was already under way, nigh on impossible. On 26th October, the Germans launched an attack on Nieuwpoort which a combined Belgian-French force was only just able to hold off. 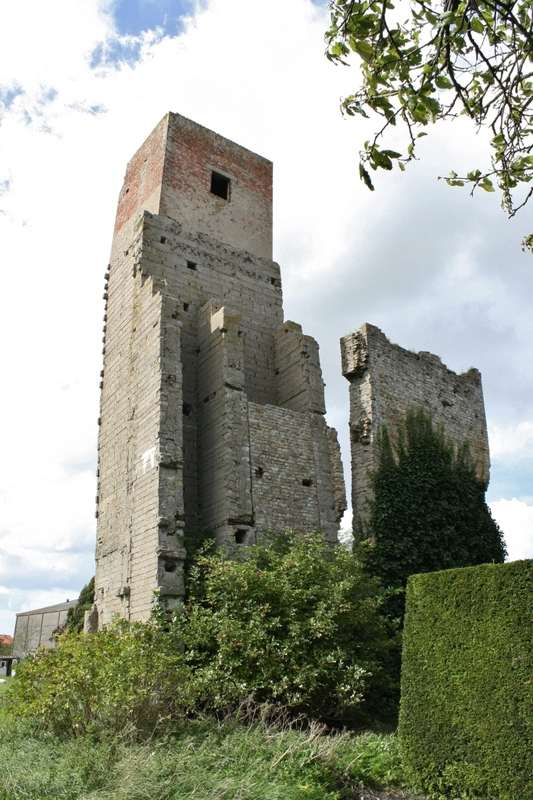 Turning their attention south, the Germans fell on the villages of Ramscappelle and Pervijze. 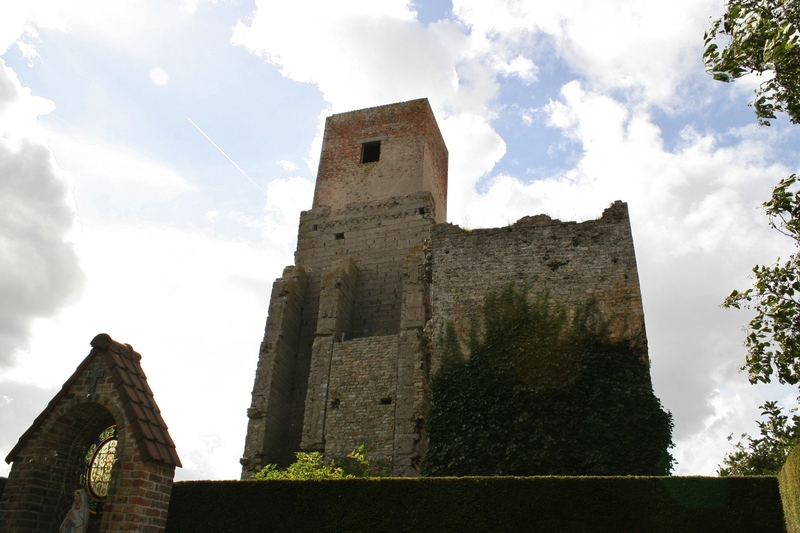 By mid-morning the situation at Pervijze was so critical that the order was given to evacuate Furnes (now Veurne), some five miles away to the west. The situation in Pervijze was saved by the French 42nd Division, the majority of whom were French colonial troops, whose counter-attack held the Germans at the railway embankment which runs through the outskirts of the village just as it does at Ramscappelle. 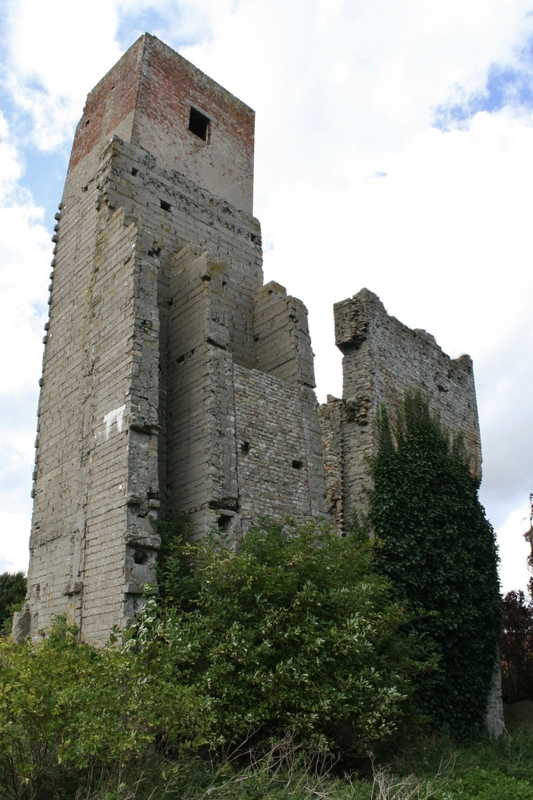 Attacks continued throughout the next few days, and on 30th October, as we saw in the previous post, Ramscappelle briefly fell to the Germans and Pervijze was close to following suit. However, as you know by now if you’ve been following, by this time the waters were rising and the Germans were forced to retreat. 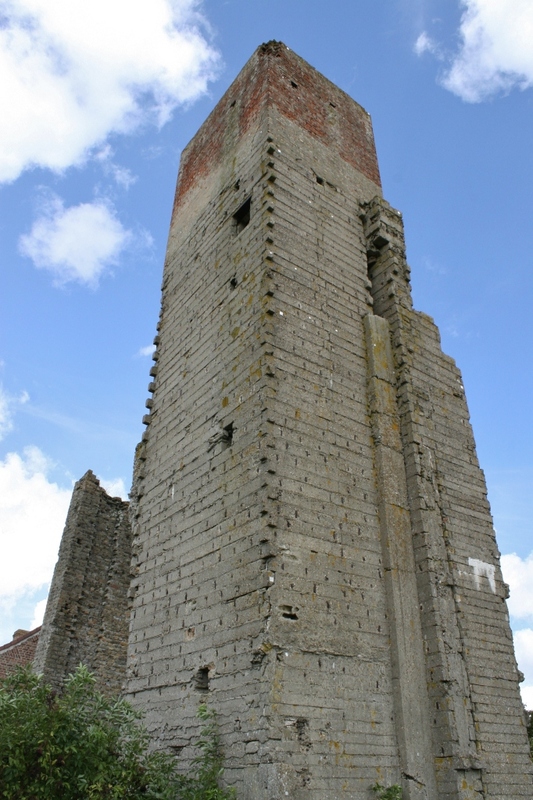 The ruins of Pervijze remained in Belgian and French hands for the rest of the war. 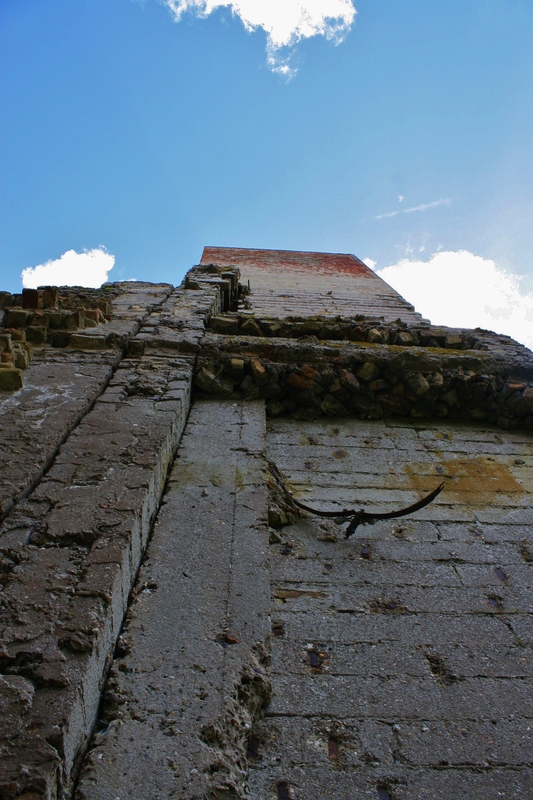 This observation tower was probably built much later, in the autumn of 1917, primarily to observe the new German long range gun known as Long Max, which had begun lobbing shells at Dunkirk from Leugenboom away to the east in June of that year. 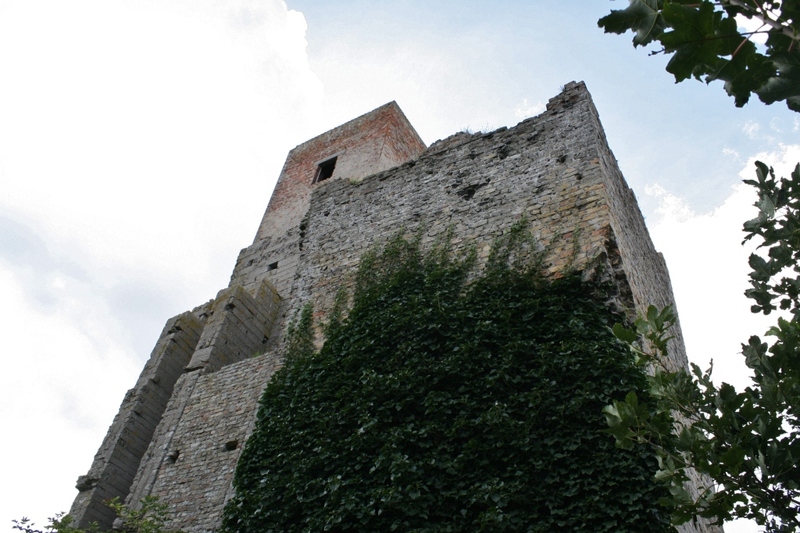 Each shell, weighing more than 1600 lbs, took one and a half minutes to arrive at its target, allowing observers in the tower time to signal a warning to the town, where a loud whistle would be sounded to alert the town’s inhabitants. Quite what they were then expected to do in the remaining few seconds before the shell arrived I am not entirely sure. 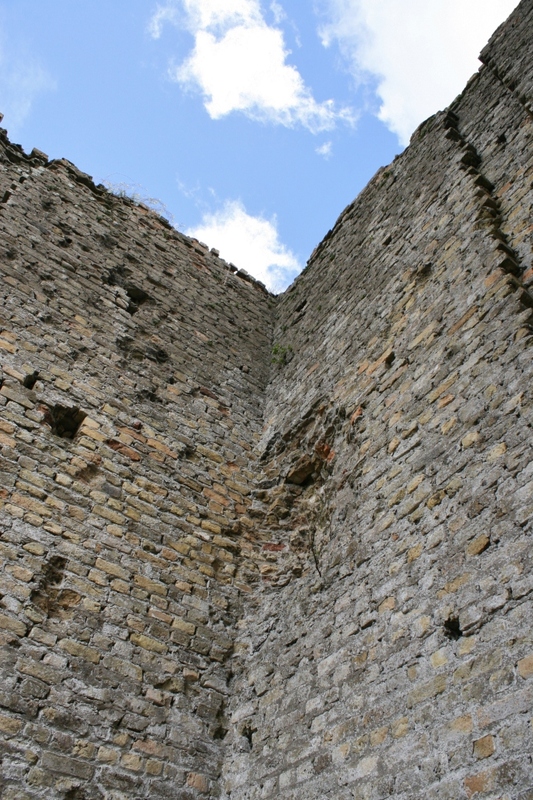 The tower was built of pre-cast concrete blocks inside what was once the presbytery of the Church of St. Catherine which once stood here. 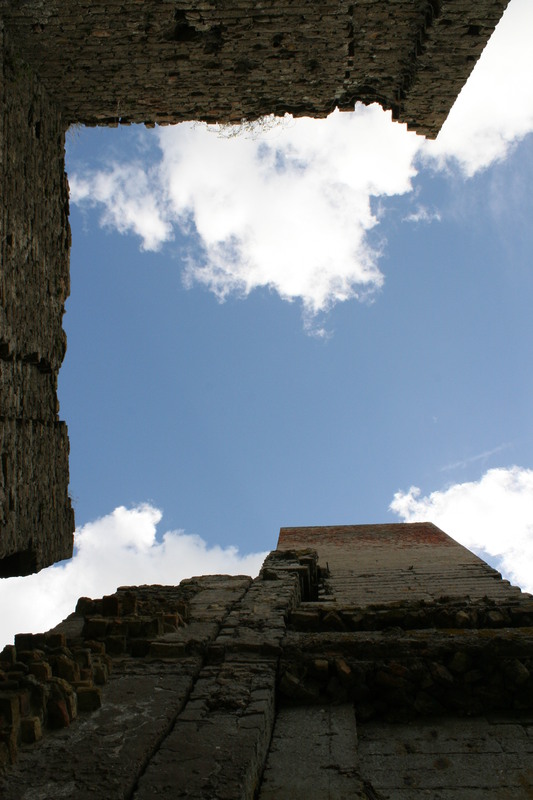 The brick extension on the top of the tower is a German Second World War addition. 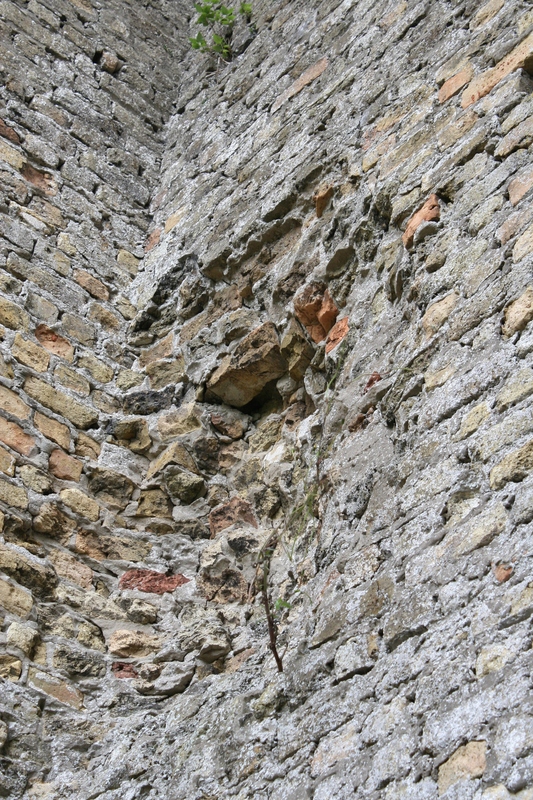 …and on the ruined wall next to the observation post a much larger shell has left its imprint in the brickwork (above & below). I suspect that it was a First World War shell that caused this damage, but we will never know for sure. I don’t know what you think, but I reckon that the locals need to administer some serious tlc to the tower if they want this war relic to remain standing for too much longer. There’s an interesting story, and indeed an interesting book, about two English nurses, Elsie & Mairi, who went to Belgium in September 1914 and spent the next three and a half years tending the wounded in a cellar in Pervijze. Worth a read. Anyway, time’s a’pressing, and we must move on. A brief diversion east next, to a hamlet not so far away where the Germans did manage to gain, and keep, a foothold, before we continue our journey south towards Diksmuide. 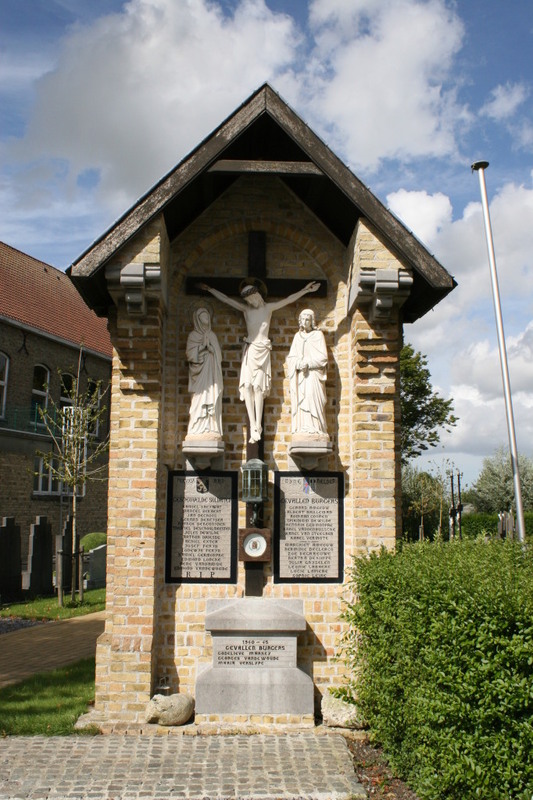 This entry was posted in Belgian War Memorials, Ramscappelle & Pervijze, The Belgian Sector. Bookmark the permalink.